October is Black History Month, but Black history is important no matter the month. However, it is a chance to turn to our LRC collections to see whether we are providing information for everybody. We would like to highlight our new books that focus on people and cultures who haven’t received adequate visibility in our mainly White-centred literary and academic world. At Hillcroft we acquire resources that are reflective of students’ various backgrounds and ethnicity whilst being of interest and importance to studies and lives. We are always open to suggestions for authors to try out, so keep your eyes peeled for new books and other resources to suggest too. 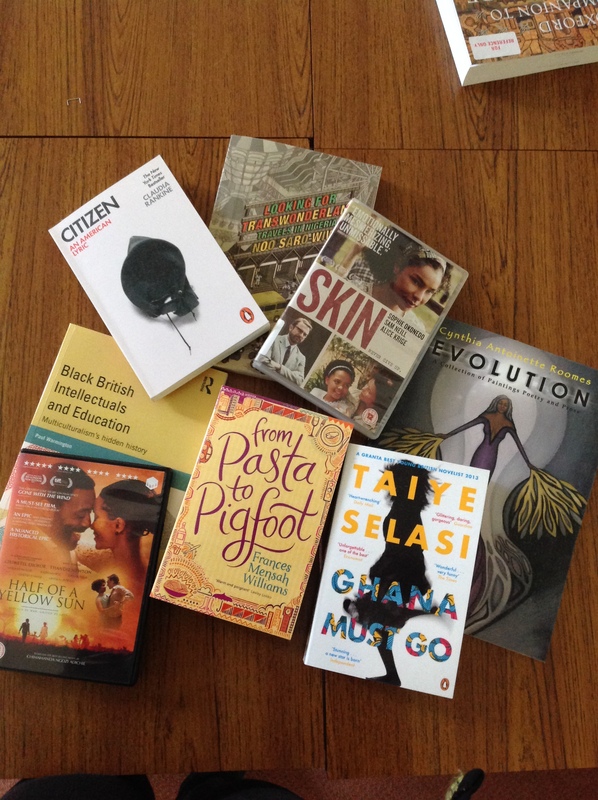 Non-fiction: Looking for Transwonderland (England and Nigeria), Black British Intellectuals. Let us know what you think of our new books and DVDs. We’re excited to discover we have been selected to be a World Book Night 2015 Institutional Giver. 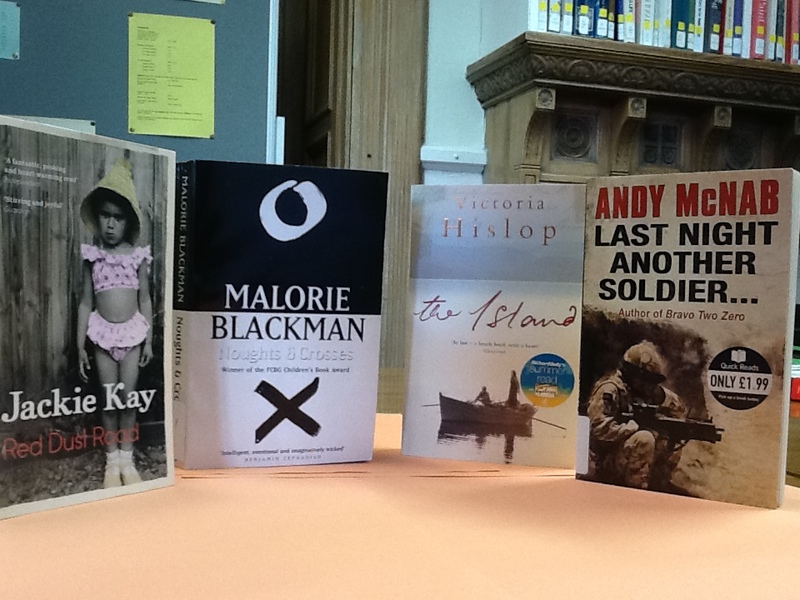 We’ve selected the books we’d like to give from the World Book Night 2015 list. We’ve now found out which book(s) we are giving away but we’re keeping it under our hats so we don’t spoil it for our staff and students! We’ll be running an event for World Book Night at Hillcroft College for students and staff. As well as giving out the books from the 2015 list we’ll be getting students and staff to register to give away secondhand books they like or new ones they’ve bought themselves. If you’d like to do the same here is the link to be a World Book Night Volunteer. We’ll let you know more about our event shortly. A quick message from the LRC team today. Whether it be for Christmas or another festival or celebration, we wish you all happy holidays. We are looking forward to seeing you all from 5th January 2015. If you have any suggestions for books or other resources the LRC could order for next term please email us over the holidays (lrc@hillcroft.ac.uk). Then we can evaluate your request when we get back and see what copies we could buy. Brian Wilson (2008). No changes made to image. On Wednesday 23 April our Learning Resources Centre (LRC) will be a giver for the first time in World Book Night 2014. World Book Night celebrates books and reading and takes place annually on 23 April which is the date of William Shakespeare’s birth and the death of the Spanish novelist Cervantes. Due to the importance of the date the United Nations Educational, Scientific and Cultural Organisation (UNESCO) named it the International Day of the Book. and Armistead Maupin’s novel Tales of the City. We’ll be giving copies of the books away to our learners and having an evening event to celebrate. In preparation we’ve ordered the DVD of Tales of the City for our students to borrow. This year anyone can be a World Book Night Giver. You can give anyone a book you own or bought. If you’d like to do this you can register on the World Book Night website and get the chance to enter a prize draw. You can take part by attending a World Book Night event up and down the United Kingdom. You can find them all listed on our Online Public Access Catalogue onsite and offsite. There’s also a host of useful information to help you study better oon the Palgrave Study Skills website. We’ve now got our Online Public Access Catalogue available on and offsite. If you’re using our ebooks you’ll find the catalogue is an easy gateway to ebooks from both our Dawsonera and ebrary suppliers. You’ll just need to put in your OpenAthens username and password to read them.